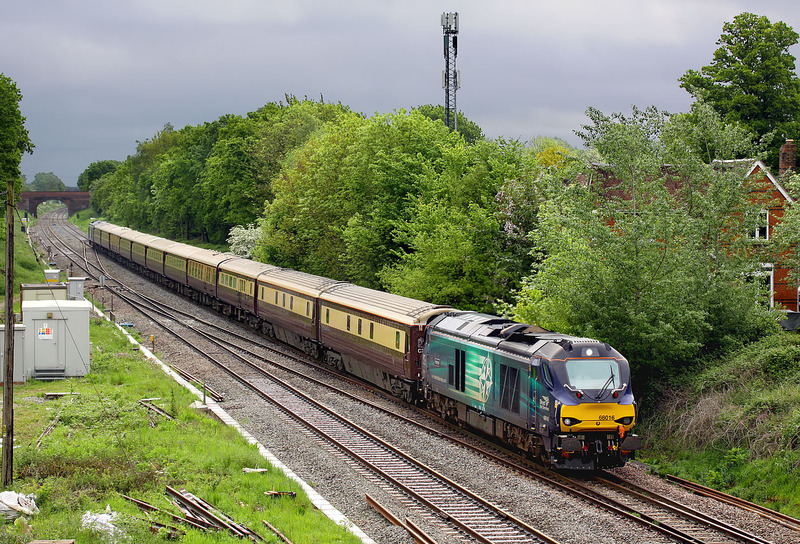 68016 Fearless passes Uffington on 21 May 2016 with the UK railtours 1Z27 07:09 Paddington to Carmarthen 'Welsh Dragon' railtour. 68017 Hornet can just be seen on the rear of the train. As this was supposed to be a completely cloudy day, I decided on this location, which would normally be hopeless if there was any chance of sun, especially this early in the morning. Amazingly just as the train came into view, the sun almost fleetingly broke through the dark clouds, brightening things up slightly. Another strange thing was that I drove to the location in drizzle, and back home in rain, yet for the time I was on the bridge there was no rain!